I love birthdays. Growing up, we normally did not make a huge deal about birthdays, with parties and gifts, but it was still a special day. We always chose our own cake, and we always felt special on that day. However, it wasn’t just one birthday. We “celebrated” our Islamic birthday too! One of my favorite things growing up was having two birthdays. I had TWO days that were extra-special for me! I’ve continued that with my daughter – she was born two days after Eid, so we always do a little something special for her on that day. Nothing major, but special nevertheless. 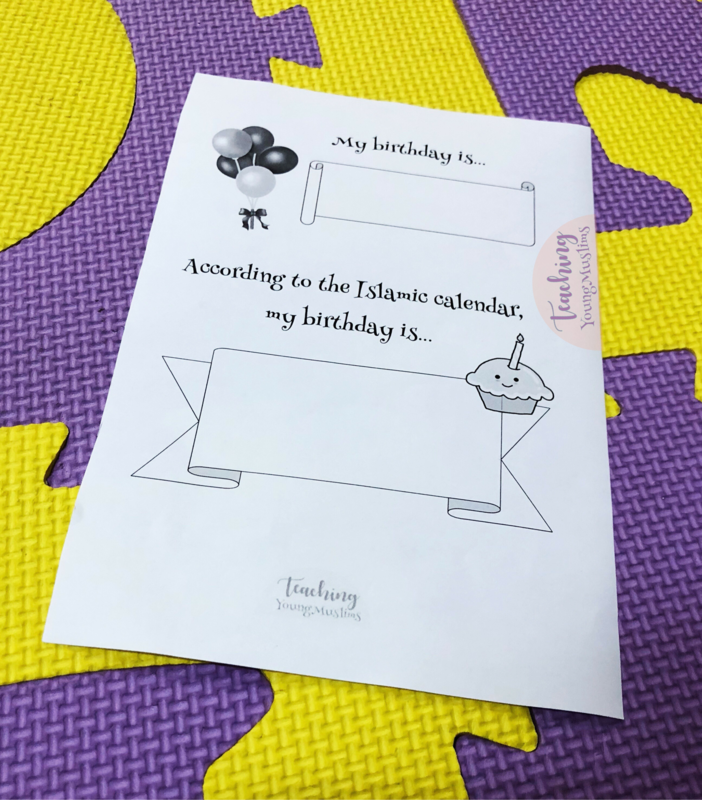 FREE DOWNLOAD: Click HERE to download this fun poster for A4 size paper and HERE to downlad it for letter size paper for your kid to write down his/her birthday – and Islamic birthday! Make a big deal about it. Make it fun and exciting! Figure out how many days are left until their Islamic birthday. Which birthday is coming up sooner? How old are they be according to the two different calendars? Fun side-note – since the lunar year is shorter, your kid will turn the next year older SOONER according to the Islamic calendar. Kids are always in a hurry to grow up, so this is a definite perk for them! I’ve been thinking a lot about Islamic birthdays recently, because mine is this weekend. And for that reason, I have some BIG NEWS. To celebrate that and to celebrate Teaching Young Muslim’s TWO YEAR blogiversary, WE ARE HOSTING A GIVEAWAY. As always, if you loved this post – and you want to make sure you don’t miss any future post – be sure to subscribe via email ~ the link is on the side! 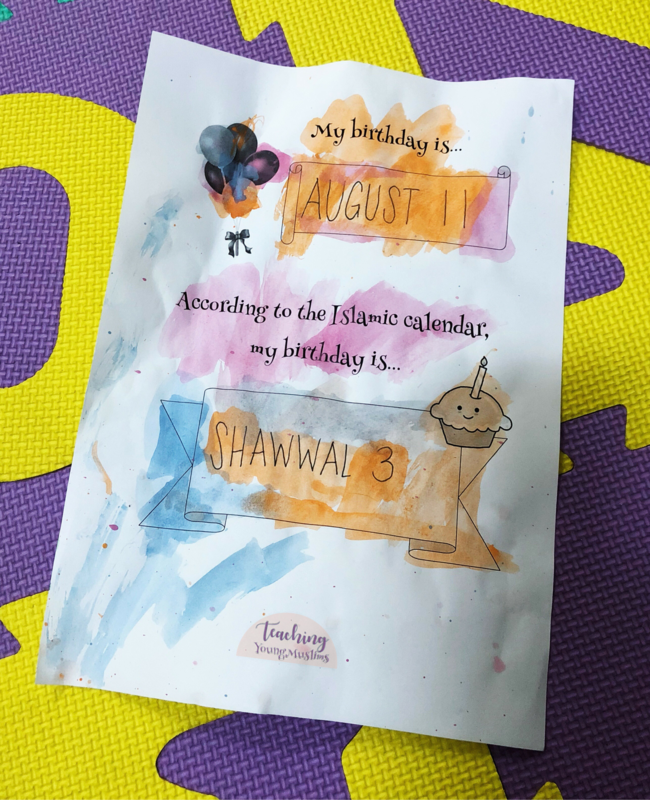 I’m curious – do YOU celebrate Islamic birthdays in your home? If yes, what do you do to celebrate? If not, do you think you might start? Let me know in the comments below! We have always celebrated Our children’s Islamic birthdays. English date birthday at school and islamic date birthday at madrassah. I love it! At times I would wonder if I’m the only one who is celebrating both my girls’ birthday twice! 1 daughter was born on 13th Rajab (Imam Ali a.s.) and the other on 9th Rajab (by some reviyat, its the birth of Baby Ali Asghar a.s. Imam Hussain a.s. youngest son)!